I'm so sorry. 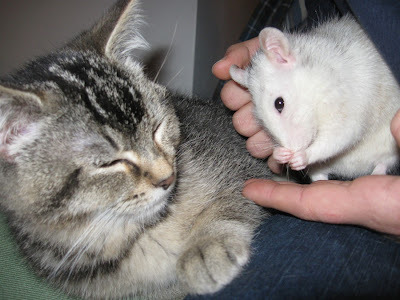 Rats are so small and fragile, and yet can bring out so much love in their owners. It's a comfort to know that she had such a wonderful home during her time here. Thank you, Gail. It is a comfort, I agree. I am sorry to hear about your rough week. Losing a dear pet is also difficult. I hope the next week will bring peace and smooth waves. I'm so sorry you lost a dear pet. Yes it's hard and hard to see ones own children confronted with death and grieving. Thank you, Teresa. Your sweetness continually leaves me at a loss for words. I know what you mean though-- even the smallest losses remind us of the big ones, both those behind us and those yet to come. I know my girls were thinking about that, too. Loss is intrinsically hard. Big hugs back to you! Those little family members are such great teachers! We had two gerbil brothers. They have both passed, with a surprisingly strong tug on our heartstrings each time. Truffula, thank you for the kind words.